Always a reasonable result for a reasonable fee, always. Among my annual New Year’s Resolutions is a pledge to keep current with respect to 1099 reporting requirements to avoid extra work at year-end. Then, by the end of January I have both quit the gym and stopped thinking about Forms W-9 and 1099, only to regret neglecting both as January approaches. Someday I will keep those resolutions. My physical and mental health will be much the better for it. · setting forth the amount paid and name, address and tax id number of the recipient. The IRS provides Forms 1099-MISC and 1099-INT for these purposes. It also has created Form W-9 to formally request the name, address and tax id information from people and entities we pay. · February 28 to provide the Forms to the IRS or April 1 if such IRS filing is to be made electronically. The 1099 reporting rules are many and nuanced. The best explanations of the rules as to which payees and payments must be reported (and those which may be omitted) are found at www.irs.gov. The 2013 Instructions for Form 1099-MISC and General Instructions forCertain Information Returns are particularly helpful. Stiff penalties may apply for non-compliance with the 1099 reporting rules. To help me remember the rules, a few years ago I developed a flowchart, supported by some explanatory Notes. Maybe this information will be useful to you. Note 1. The reporting requirements apply to all bank accounts – firm money and trust money. The fact that a third party’s tax id number might be assigned to the bank account (e.g., an IOLTA-type trust account) has no bearing on the situation. If the bank account is controlled by the law firm, include those transactions in the 1099 review. Note 2. Interest reporting applies to amounts earned in trust accounts which are credited to the client’s trust account balance. Interest earned on IOLTA-type accounts paid to the State Bar or similar organization is not reportable. 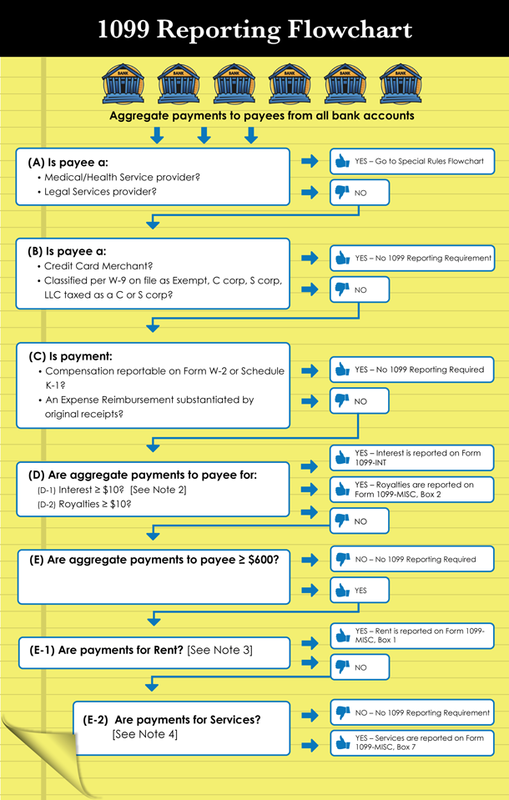 Interest payments to a W-2 employee are reportable on Form 1099-INT. So-called “interest” earned by a K-1 partner or member are reported on Schedule K-1. Note 3. For 1099 reporting purposes, the term “rent” encompasses office lease payments (including real estate tax and operating costs), rental equipment, meeting rooms, banquet halls and booth space; but not space in a storage facility. Example 1. Firm purchases generic office supplies from vendor not otherwise exempt from 1099 reporting requirements – no 1099 reporting required since office supplies had no work or labor component. Example 2. Firm purchases office supplies from same vendor to which firm’s name or logo is affixed – since labor is involved, purchases from vendor require 1099 reporting. Example 3. Firm’s outside IT consultant provides services and parts/supplies. 1099 reporting is required for the paid services and for the paid parts/supplies unless parts/supplies separately substantiated by original receipts. Example 4. A scholarship is provided by firm. No 1099 reporting required provided no labor or work is provided in exchange for the scholarship.